Hong Kong is a city that literally bristles with excitement; there’s a vibe, a buzz, a sensation you can’t get enough of. But, with so much to see and do, how do you pack it all in? It’s simple – you spend longer there, or follow our guide to our favourites! 1 Shopping: Hong Kong is renowned for it’s shopping. Whether you’re in the market for haute couture labels or fancy haggling like a local at the markets, you’re in for a real treat. From fancy malls to street stalls and factory outlets, you’ll find a special blend of countless world-class brands, talented local designs and centuries old crafts on offer. The rich and famous will head to SoHo, Admiralty or Central, while some refer to Causeway Bay as the Olympic Games of the shopping world. Hong Kong is famous for its tailors who will measure you and then whip up a sensational outfit within hours! For great local shopping, you can’t miss Temple Street Night Market where you can snag a bargain, have your fortune told and be entertained by performing artists. Keep your eyes open – there are often film crews around shooting the next blockbuster! 2 Wining & Dining: The city teems with fine dining establishments, but the street food truly is soul food – try the iconic cart noodles! Try the world’s largest floating restaurant at Aberdeen or head to Ashley Road, which is a melting pot of multicultural restaurants and bars. 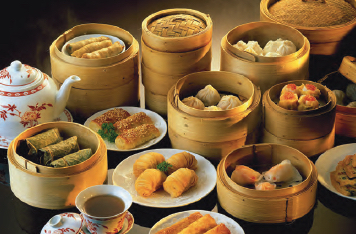 Get you fill on some of the most amazing seafood or dim sum, fine dining or fusion … the choice is astounding. The bar scene is hot with new and more exciting venues popping up almost weekly! If you like the local milk tea, Little Lab at Central serves up Hong Kong’s alcoholic version – sensational! 3 Cruise Victoria Harbour: There are hop-on-hop-off cruises that will help you wile away an afternoon or try an evening cruise to take in the night lights. The pre-dinner sunset cruise offers unlimited complimentary drinks, while the dinner cruise packs a punch with vistas of the most iconic sights, a buffet dinner and live band. And you really shouldn’t miss the light show – it’s even more spectacular from the water! Why not take a ferry across to one of the Outlying Islands such as Lantau or Lamma. 4 Ocean Park: This marine theme park is a combination of exhibits, rides and shows. Give yourself a day here, especially if you’re taking young ones! You’ll see sharks, rays and penguins before moving onto koalas, wallabies and kookaburras. Dangle off a cliff in the floorless roller coaster hang upside down and swing from dizzy heights, take a raft through a rainforest or visit the giant pandas. There truly is something for everyone here! For a real buzz, ask about their special behind-the-scenes tours – I managed to swim and play with the dolphins! 5 Take in the views: In Hong Kong, you’ll find you’re either looking up or down most of the time. Look skywards and take in the fascinating architecture, and then head to one of the many vantage points to get a different perspective. One hundred floors above the city sits the Sky100 Observation Deck offering 360-degree views of the harbour (hold your tummy – the lift gets you up there in just 60 seconds!). Head up The Peak where you can see all the way across Victoria Harbour to the New Territories. You can walk it if you’re keen, or take the tram up and the double decker bus back down. 6 See the light: Doesn’t sound like much fun, but it’s a sight you won’t forget in a hurry. Hong Kong’s buildings come to life at dusk every evening with a computercontrolled neon light show that made the Guinness World Record book. It’s even more special if you’re visiting during Christmas and Chinese New Year. Make sure you get a good vantage point from a tall building or from the water! 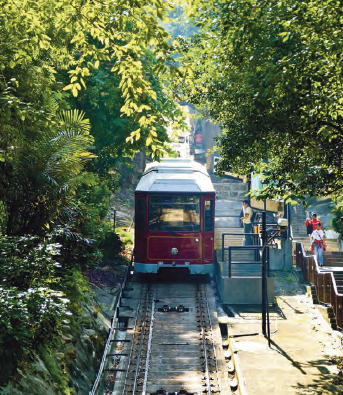 7 Get Cultural: From monuments to temples, Hong Kong has a rich cultural history that weaves itself into everyday life. Museums abound with fascinating collections such as triad rituals or tea wares. Historical sites include a harmonious blend of colonial and Chinese, such as The Clock Tower and 1881 Heritage, the former police headquarters where you can now shop and dine. As I said right at the beginning, there’s myriad things to see, do, taste, smell and experience in Hong Kong. Quite frankly, one trip will never be enough. If Hong Kong is in your sights, do yourself a favour and head to the Discover Hong Kong website where you can make use of the My Hong Kong Guide that becomes your free personal guide, complete with offline access and e-coupons! Simply register and log in and you’re all set to create your very own plan of attack to ensure you get as much as possible out of your trip!